It is hard to find anything bad to say about chocolate. Now we have even more good things to say. Recent research published in the Journal of Physiology has shown that dark chocolate improves our health much like exercise. In fact, scientists are calling it "as good for you as exercise." We may have always suspected this, but now there is science on our side. 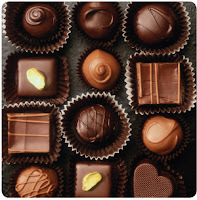 A recent research project, based at Wayne State University in Detroit, studied the effect of chocolate on health. Specifically, they measured the impact of a chemical found in chocolate called epicatechin. Their theory was that the tiny powerhouse within all cells, called mitochondria, responds to epicatechin in much the same way they respond to increased demand caused by exercise. Aerobic exercise causes our cells to develop additional mitochondria. Having more mitochondria improves stamina and endurance. For this experiment, the researchers used lab mice and studied their performance running on a mouse-sized treadmill. One group of lab mice received 30 minutes of exercise on a treadmill every day. A second group of lab mice received two doses of epicatechin (that component in dark chocolate) instead of the treadmill exercise. After 15 days of these treatments, the treadmill performance of the two groups of mice was compared. The scientists found that the two groups of mice had both improved their treadmill performance by approximately the same amount. Chocolate was equal to running! As we get older, the number of mitochondria in out muscles decreases. This reduces our strength and our endurance. Lead researcher, Dr. Moh Malek said, "Applying what we know about epicatechin's ability to boost mitochondria numbers may provide an approach to reduce the effects of muscle ageing." The scientists experimented with middle-aged mice also. They found that these mice benefited most when both exercise and epicatechin were used. This finding shows promise as a possible way to counter the effects of muscle ageing. Although no claims are made by these scientists about the application of their research to people, this is yet another reason to keep good dark chocolate on hand!